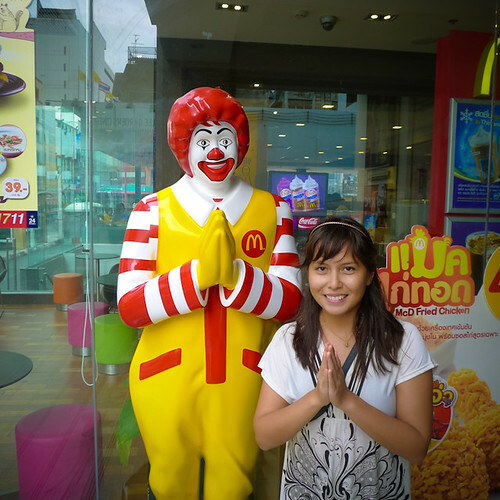 One of the few things I know how to say in Thai is hello. If you are female, or identify as one, you say, “Sawadee-ka”. 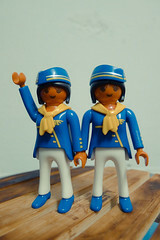 If you are male, or identify as one, you say, “Sawadee-kap”. When saying hello to someone in a higher position as you, such as your boss or a monk, you should put your hands together and bow. This is called a wai. To me, it’s still a bit unclear on when and who to wai to. Usually children will wai to you, if they have good manners. But I’ve read that it’s silly to reciprocate with a wai back to a child. At the supermarket, some of the cashiers will wai to me after I make my purchase. I just bow my head to them and / or smile, but I’ve see other people just completely ignore the cashiers. As for my students, they’ll say hello and wai to me. Some Thai teachers will wai back, and others have complained that only saying “hello” is so informal and borderline rude. These teachers think that the students should say “Good morning / afternoon, teacher”. I don’t wai to my students, but I’ll just smile and wave instead. Ronald & I demonstrate the proper way to “wai”, featuring guest photographer Brent. But what about Ronald McDonald? Do you wai back to him? I’m sure it’s ok to wai with him, but it’s a red flag to the songateow drivers that you aren’t from there (aka potential sucker for tourist traps). 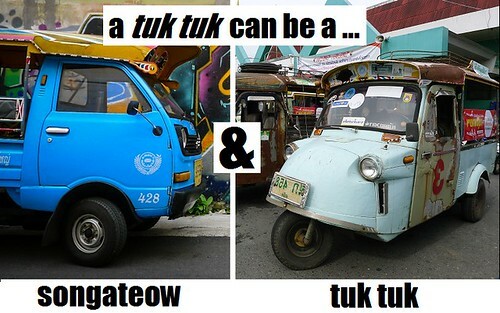 A songateow is different from a tuk tuk, but I use the same name for both modes of transportation. Here’s another mini lesson, on what the two different vehicles look like. Different vehicles, same name. 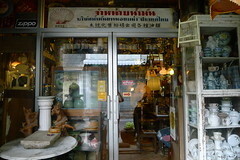 The songateow was in Hat Yai, and the tuk tuk was in Trang. 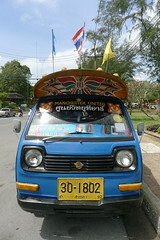 To see more modes of transportation, see my set on Flickr called Thai Go Go Mobiles (and yes, that’s a wink to Tom Haverford).